According to BoyGeniusReport, a survey sent out to customers leaving Verizon Wireless asks whether it was the iPhone, among other things, that was the reason for the departure from Big Red. One question asks what the carrier could have offered you to have kept you as a customer, and one of the choices to select is the iPhone. The obsessive sounding focus on the iPhone could be the carrier's way of admitting that the BlackBerry Storm is not going to be the iPhone killer it was intended to be, and that the only thing that could kill AT&T's iPhone as far as Verizon is concerned, would be an iPhone branded with the Verizon logo. I wonder if Apple will ever open up and stop being so exclusive! I hate that all my iTunes music can only be used with an iPod! At least verizon has decent phones. Att is only afloat BECAUSE of the iphone. EDIT: The wireless division anyways. way to show yor iphone bias again phone arena. another merritless asumption. i work in a VZW store. you would not beleive how many people have the iphone come in and trade it for a storm with a big smile on their face. they thought the iphone did alot, it doesnt, the storm does. I get the same but the other way around, they thought it was a good touchscreen, it isn't. At least they can recieve a picture message. So I guess it's become an "obsession" with the iPhone? Seriously. I haven't heard much biased news on the website but I can gaurantee that when it comes, the news blows things completely out of proportion. GO VZW! WOW 15 answers for that question and 1 of them is wanting the i-phone thats obsurd wouldnt it of been easier if they asked a simple question like that but let the customer write it in a sentence so they dont look distraught by the I-phone?? Example: What is the PRIMARY REASON you disconnected your line of service with VERIZON WIRELESS? Customer: Because I could not afford it anymore. Example: What is the PRIMARY REASON you disconnected your line of service with VERIZON WIRELESS? Customer: I disconnected my line of service because I wanted another carrier. 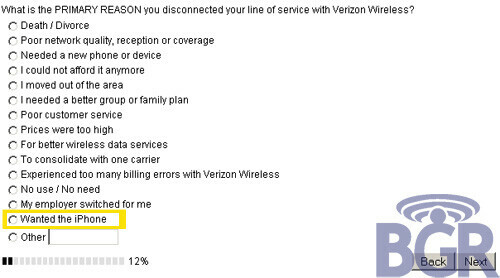 Example: What is the PRIMARY REASON you disconnected your line of service with VERIZON WIRELESS? Customer: Because I so love the I-phone its the best phone ever I dont even like at&t so I got the phone and unlocked it!! C'mon phonearena, that is quite the stretch. Has verizon burned you guys in some way? Sounds like it. It's amazing how people are so quick to defend Verizon, but will talk a lot of mess about AT&T. Both are great carriers, but Verizon shouldn't get so big headed just because it became one of the largest networks in America. AT&T could easily buy out a carrier if they wanted too. Probably is, there's not a lot of GSM carriers in America. The reason that alot of people talk crap about ATT is because it is a bunch of crap! Verizon is not big headed because they became the largest network, they're just that DAMN good! ATT couldn't buy out another carrier if they wanted too, they dont have that much money. fanboyisms aside, VZW has a larger coverage area than every other carrier in the US, FACT. It has BY FAR the largest DATA network by leaps and bounds. ATT 3g coverage 25-30% US. VZW 3g coverage 85-89% US. are they close? NOPE. vzw was on its way to biggest carrier without the alltell buy out, they just sped it up by a few years. and no other company has the cashflow that VZW has in the US wireless world. Its just a well oiled machine. Wich is easily proven by the fact that even before the alltell buy out, VZW had the largest profitability of the carriers, and was not #1 in customers! You all know that Apple came to big red and offered them the iPhone first right? Big Red declined because Apple wouldnt allow Verizon to do any tech support or troubleshooting from their techs..........thus the reason for Apple to opt for the 2nd best company. I thought it was because Apple wanted more money from the data plans. Plus Apple didn't allow insurance to replace damaged iPhones, and all of VZWs phones are one an insurance agreement. I'll never get over how people continue to bash this site for listing iPhone news. I read this same news on a few other sites too, it's news, it's about wireless service, it's on a site that reports wireless news.... This seems pretty obvious... Just because you don't find it newsworthy doesn't mean the other people who visit the site feel the same way. I could care less about hearing about alot of news on this site but I'm sure someone else probably wants to hear about it. Also, OBVIOUSLY with the popularity of the iPhone it's gonna be a big reason why people leave VZW. As the intelligent carrier they are they want to compile as much data and specific reasons about why a customer would leave. Get over your iPhone hatred and see it for what it is, which is quite obviously a good thing for them to compile more specific data about their churn. Damn it, remixfa is still here :( I have the iPhone and work for VZW.....the iphone beats out ANY phone we sell...hands down.....its just a same i cannot get our service on the iPhone.....then the phone would be truely amazing! Ummm, seriously???? The iPhone's TOUCHSCREEN beats out anything Verizon has. Seriously!!!! That's as far as I will go with that!!! Perhaps they shoudl try letting people fill out the survey before they leave! I have conveyed my disatisfaction with them requiring that anyone that buys one of the newer Smart/PDA style phones have a data plan. I have been fine with synching my calender via USB for years, and cannot see paying almost $400 a year for a service I do not need. AT&T only requires a data plan on the IPhone! With AT&T it's required on other PDA's in order to get the MIR, but not all of them If you don't add it you just don't get the MIR, but I still agree it's a better way to do it so the customer has options. To HOVA ... ( in response to your post on #18 ). I totally agree with you on that. VZW is a smart company that simply is trying to compile data to see why customers would leave. I do, however, disagree with your assessment that people on this site are trying to burn PhoneArena for being biased. I feel the same thing that they do. Look at the report ..... To say that Verizon is disappointed in the BB Storm NOT being the "iPhone killer" they hoped it would be? Are you kidding? The touchscreen is probably the ONLY area the iPhone wins in. I'm upset with this report because it sounds like bias....AGAIN!!! The Storm was a MEGA success from the time it launched and it continues to sell thru the roof. The reason "wanted to get the iPhone" is even an option on the exit interview is actually a reason why I've heard people leave Verizon. Believe it or not, with the exception of affordability, it's the reason I hear the most ( by the way, "affordability" would be along the lines of security deposits and data plans for PDAs....not voice plans ). I've worked in journalism before and you are supposed to have an UN-biased view on things. It separates FACT from OPINION. So hear it is: Verizon has "left for the iPhone" as an option for Why Customers leave: FACT Verizon feels the Storm is not the iPhone killer it was supposed to be: OPINION Both devices are great but the Storm has more bang for the buck. It has a lot more functionality. FACT. The iPhone simply has the "cool" factor. OPINION (based on spec FACTS). And for you grammar fanatics before I get ridiculed, it should've been THEIR not there, lol. I won't deduct points for grammar. But my post was in criticism mostly to PhoneArena...since they're on the iPhone's jock strap.